Having visited the same shopping complex while eating at Brewster's and Sushi Line, I noticed a small bakery next to a convenience store. To me, there was not much to think about. Normally, when I'm craving carefully crafted pastries, it's usually in Vancouver, specifically in Downtown. 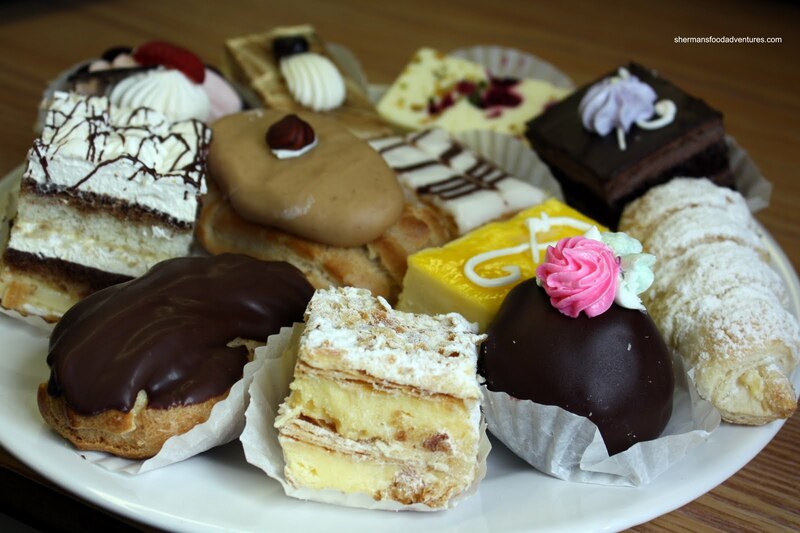 The last place I'd expect European pastries is in Newton (no offense, but it's not the mecca of desserts). But once again, it's usually in the oddest of places we ultimately find good eats. Case in point, Ah-Beetz in Abbotsford, Lhy Thai on Edmonds and Rehanah's Roti out in Port Moody. Being the curious person that I am, I did some searching around on the internet. Yah, there area a few positive comments about the place. Hmm... Okay, I even went as far as asking some locals and apparently, this place is solid. 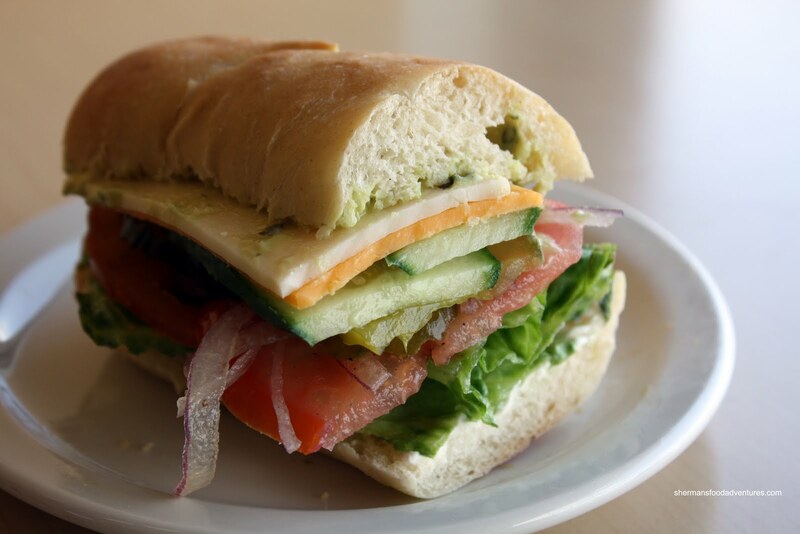 In fact, they also serve up some good sandwiches and paninis. Alright, I'm sold. Just before I left, Hot Mama asked if I'd pick up a sandwich for her as well. Hey, I'm game for that, more food to take pictures of! Although being quite small, there is a nice cozy area for those who want to eat in and a few tables outside. 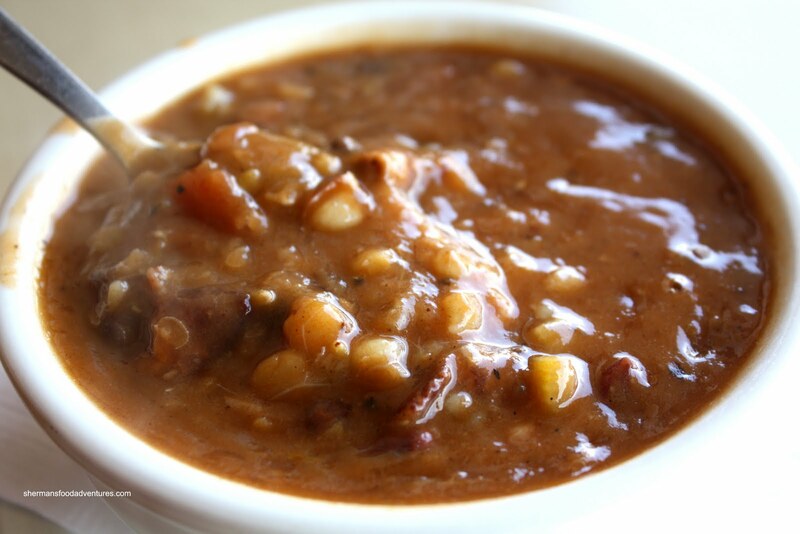 I decided to go for the soup of the day which happened to be Bacon & Bean. That was probably a bad decision in retrospect... Beans... Anyways, I really liked the soup. It was a meal in itself with plenty of perfectly textured beans (soft, but not falling apart) and of course bacon. Slightly smoky and a touch sweet, I was pretty full after this. But then I had to contend with the Prosciutto & Pesto Panini as well. If you look at the picture, it's quite evident that there is more filling than bread. 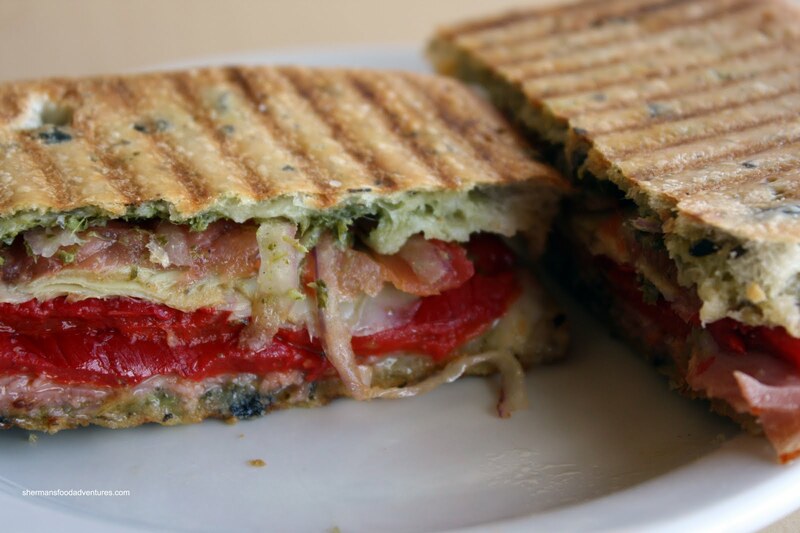 A nice combination of roasted red pepper, red onion, artichoke, pesto and prosciutto were stuffed into a nicely crisp package. I thought the flavours worked really well with a bit of saltiness (not overpowering), tartness and sweetness. I picked up a Veggie Delight sandwich for Hot Mama and quickly snapped a staged picture before leaving. 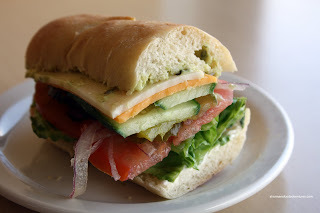 Yah, I violate other peoples' food for my blogging purposes... Just by looking at it, you can see the plentiful amount of fresh ingredients in this sandwich. Hot Mama really liked it and agreed it was indeed fresh and quite tasty for a vegetarian sandwich. 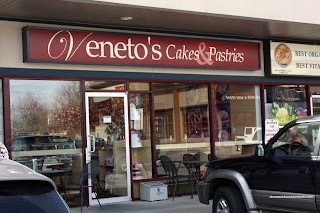 Lastly, I couldn't leave Veneto's without picking up a dozen items from their display case. Without going through every single item like Mijune (who is probably more qualified to talk about sweets than I would anyways! ), I will make a blanket statement about them. By polling the people who did try some of the items, it was pretty much unanimous that they were pretty good. Maybe a tad less refined than the ones you'd find in some of the Downtown bakeries. Naturally, some items were sweeter than others due to their ingredients; yet as a whole, nothing was crazy sweet. 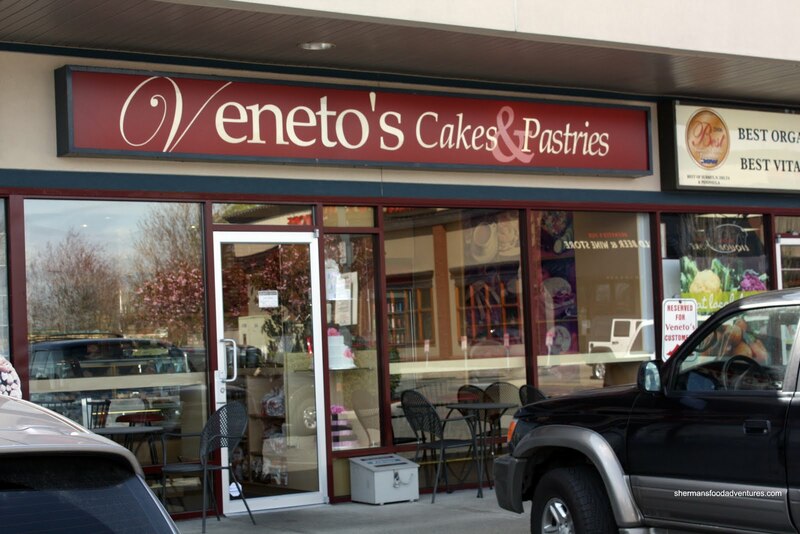 Furthermore, let's be serious here, the prices are very reasonable at Veneto's and there is not much to complain about. If you look at the picture, it's quite evident that there is more filling than bread. Now that more people are moving to the suburbs, it is destined that good eats will be found there. Now, for comparison purposes, how does it compare to, say, La Grotta? I think that La Grotta is in a category all by itself. But if I were to compare this panini with the one I had at Thomas-Haas, this one is a much better value! now that's a sandwich! i think i would have to split it into two open faced pieces to get it into my mouth though. i'm sad that you didn't painstakingly describe each dessert though... lol.